I'd like to present you an app of mine which might interest some of you having an iOS device. 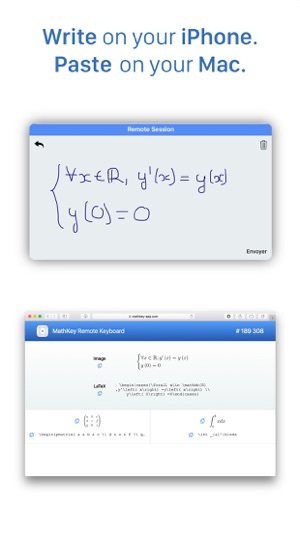 Its name is MathKey and basically it is a keyboard that converts your handwriting to a LaTeX equation. 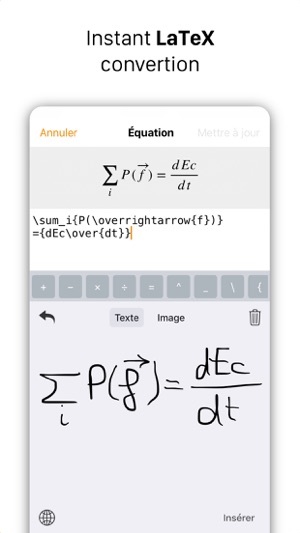 Instant LaTeX conversion : just write the equation with your finger or Apple Pencil and MathKey will convert it to LaTeX in a second. MathKey is therefore perfectly integrated in Pages, Numbers, Keynotes, Office and any LaTeX editor. Image conversion : you can choose to export the converted equation to a formatted image output. It's perfect if you are using an editor that does not support LaTeX. Remote Keyboard : Connect the app to our website by scanning a QR code in one second and you're ready to work. 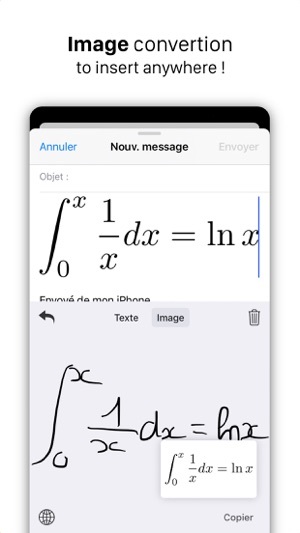 Write on your iPhone or iPad and the LaTeX and image conversion will magically appear on your computer. You can then paste the equation to your desktop editor. MathKey is powered by MyScript Interactive Ink ® technology whose accuracy has not to be proven anymore. Feel free to tell me your suggestions!